How are MIDI-settings adjusted for hardware extensions in the library? Every now and then you are asked what needs to be changed in the MIDI-settings of Score/Light or Free when the hardware is changed. Hardware means external devices like USB-MIDI-interfaces, keyboards (not PC keyboards), sound-modules or MIDI-harmonicas. In the simplest case, the MC-Score program (also applies to MC-Light and Free) is not connected to any external device. In this case songs are played on the PC sound card. The current PC's don't have an actual sound card anymore but produce the sounds with the normal processor. Therefore there is also a higher latency, i.e. : delay. This latency is program independent and cannot be influenced by MC-Score. Current keyboards have a "To-Host" USB port where a USB cable is plugged directly between the keyboard and the computer. In such cases no USB-MIDI interface is needed. But also here Windows must recognize this "To-Host"! MC-Score (also valid for MC-Light and Free) can only read MIDI data from one MIDI-IN port at a time. Under "MIDI-Setup/MIDI-In" all MIDI-IN ports registered with Windows are listed. If more than one MIDI-In is registered, the desired MIDI-In can be selected here. If a keyboard is connected to this MIDI-In, the text box should light up when keys are pressed (if the wiring is correct). After leaving the dialog with the OK button, this setting is applied. If this setting is to remain valid after the end of the program, "Save Library" must first be pressed. Figure 1 with one MIDI-In interface, Figure 2 with four MIDI-In possibilities. Now again to the latency, i.e. the delay when the Windows sound system is used. If the program is played via a keyboard and the MIDI out is set to the Windows sound system, there is a very annoying delay! Conclusion: As soon as you play with a keyboard (or another MIDI instrument), the MIDI-out of the program must point to an external sound source. Read more about this in the next section. The following figure shows two different MIDI-Out dialogs with different configurations. This dialog is called up via "MIDI Setup/MIDI Out". In contrast to MIDI-In, MIDI-Out offers extended possibilities. Several MIDI-out devices can be defined in the library. But we want to talk about the MIDI-out ports. 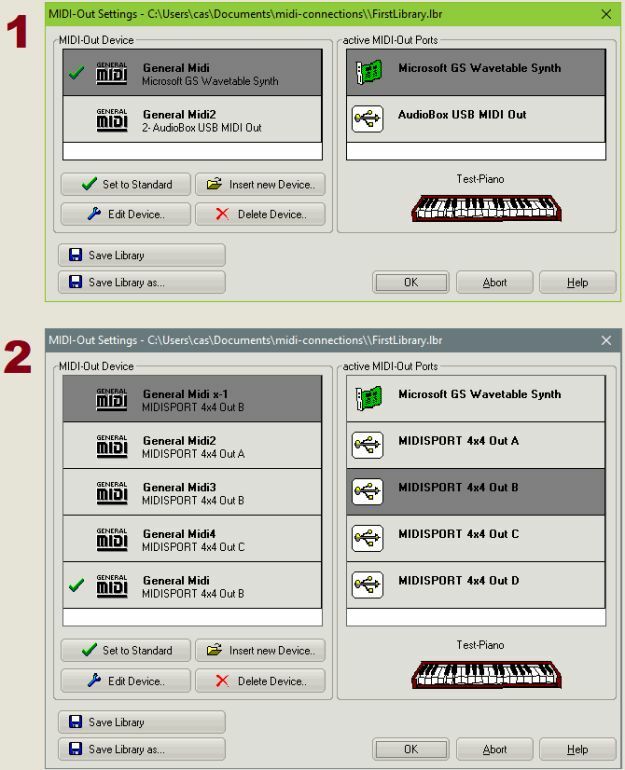 Figure 1 lists two MIDI out ports and Figure 2 lists five MIDI out ports. Here, too, "Save Library" must be selected if a change should also be valid at the next program start.